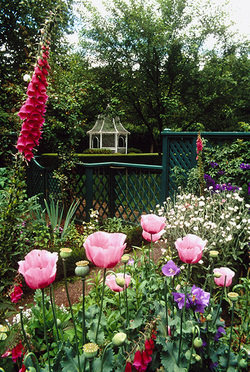 The historic gardens at Deepwood Museum & Gardens, located at 1116 Mission Street in Salem, OR are one of only two of Lord & Schryver's residential designs which are currently open to the public. Commissioned by the third owner of Deepwood, Alice Brown, in 1929, they were developed over the next decade and flourished under the loving care of their owner until 1968. Deepwood Museum & Gardens is a City-owned park and open year-round to the public. As part of the L&S Conservancy’s mission to preserve and interpret the legacy, a major rehabilitation project was begun in 2003 to raise public awareness and to enhance the visitor experience. A rigorous process of research, analysis and synthesis led to the development of plans which were implemented by a crew of volunteer gardeners (The L&S Conservancy Gardeners) with the support of the Salem Parks Operations Division. On-going maintenance continues to be provided by the volunteer gardeners. We are most appreciative of the community’s support for this project which represents a 10 year effort for a total value of over $100,000 including in-kind donations and grants from the Kinsman Foundation, Marion Cultural Development Corporation, Oregon Cultural Trust, Pratt Memorial Fund, Salem Area Garden Club, Salem Hardy Plant Society, and the Walton Trust.